Bryophyllum (from the Greek βρῦον/βρύειν bryon/bryein = sprout, φύλλον phyllon = leaf) is a plant genus of the Crassulaceae family that has sometimes been included within the genus Kalanchoe. There are about forty species in the group, native originally of South Africa, Madagascar, and Asia. The group is notable for vegetatively growing small plantlets on the fringes of the leaves; these eventually drop off and root. These plantlets arise from mitosis of meristematic-type tissue in notches in the leaves. Nowadays, bryophyllums are naturalized in many parts of the tropics, and deliberately cultivated for their attractiveness or for their interesting reproduction. 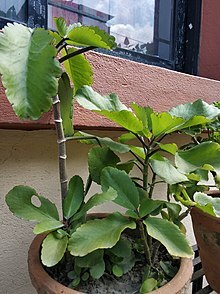 Several species of Kalanchoe are economically important for causing cardiotoxic effects in sheep and cattle, and diseases affecting the nervous system and muscles known as krimpsiekte ("shrinking disease") or as cotyledonosis. Bryophyllum pinnatum may have similar chemical components, bufadienolide alkaloids. There are many hybrids within Bryophyllum, and also hybrids with Kalanchoe such as Kalanchoe × crenatodaigremontiana (B. laxiflorum (as the synonym B. crenatum) × K. daigremontiana) or Houghton's Hybrid (K. daigremontianum × B. delagoense). Bryophyllum daigremontianum: Devil's Backbone or mother-of-thousands. Native of Madagascar; introduced and naturalized in many parts of tropical and subtropical Africa, Asia (Indian Ocean islands), North America (Florida) and South Africa; cultivated in Pakistan, India and Bangladesh for its medicinal properties. In Bangladesh it is known as Patharkuchi Pata. Bryophyllum pinnatum: Air Plant. Native of Tropical Africa, cultivated or naturalized on many Pacific Islands (Tonga, Hawaii). It is also called the "Goethe Plant" since the famous writer Johann Wolfgang von Goethe — who also was an amateur naturalist of some repute — was "passionately fond" of this plant and liked to give the baby plantlets as gifts to friends who visited his home. He also discussed his air plant at length in the essay that was titled Geschichte meiner botanischen Studien ("History of my botanical studies"). ^ Welham, Marina: How Dangerous are Euphorbias? (And Others in the Family Euphorbiaceae) with some comments on dangerous plants in the families Agavaceae, Aizoaceae, Apocynaceae, Compositae, Crassulaceae, Liliaceae Archived 2007-10-01 at the Wayback Machine. The Amateur's Digest. Retrieved 2007-09-19.